As 2007 draws to a close, the staff at MiamiTennisBlog.com would like to pay tribute to what we feel were the preeminent matches of the year. On the men’s side, the picks have been limited to five setters because undoubtedly, they were the most compelling. After making the cut once Venus Williams pulled out due to injury, Maria whose serve had been affected all year by a shoulder problem, appeared to have regained her past championship form impressively dismissing higher ranked opponents to reach the finals. In a hotly contested match lasting 3-hours and 24-minute, Sharapova demonstrated she had “game” by winning the first set 7-5 and pushing Henin in the second set prior to loosing it 7-5. The contest came down to a final third set which was fiercely disputed, but Henin prevailed 6-3. After the drama of the previous round where she won despite a calf injury, Serena continued to battle against her archrival, Henin, taking the match to an ultimate set after loosing the first. Regrettably, Serena was not a 100-percent physically and went down 6-3 in the third. For her courage and effort, we must tip our hat to Serena. Here are just a few reasons why this was a memorable match: 1) bad weather resulted in play spanning the course of four days. 2) Theatrics were the order of the day, when Robin decided that Rafa’s habit of constantly picking at his shorts between points was worthy of mimicry. And 3) this ended up being a five set marathon with great shots being made from both ends of the court. Nadal’s experience and physical strength were keys in aiding him to come out on top 7-5 in the fifth. It is doubtful that Robin and Rafa will be going out for drinks anytime soon. In his farewell Wimbledon match, Tiger Tim had fans atop “Henman Hill” on pins and needles with another five set nail-biter. The last set was dead even at 5-5 when play was suspended due to lightning. 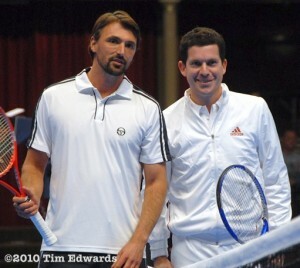 When Henman returned, he electrified the crowd with sensational shots and won 13-11 in the fifth. Sadly, the joy of his British compatriots would be short-lived as in the second round Henman would be defeated by another Spaniard, Feliciano Lopez. Anxious for a home grown champion since 1936, the Brits will have to wait at least another year. As the higher ranked player and with his previous grand slam experience, Roddick had all the elements in his favor to proceed to the next round. He was leading two sets to love and with Gasquet having never previously come back from such a deficit; Andy’s fate appeared to be sealed. But destiny took a wrong turn as Gasquet found the means to work his way back into the match with spectacular backhand passes and eventually walked away with the upset, winning 8-6 in the fifth. A dazed and confused Roddick probably had nightmares for days following that one. Subsequent to an injury-filled year which resulted in her ranking plummeting to 81, it would not have been shocking for a visibly out-of-shape Serena to lose in the initial rounds of the tournament. Williams proved all the naysayers wrong when she reached the finals where she dominated the proceedings against Sharapova, who at the time was the second seed, and earned her third Australian trophy. In so doing, Serena placed the rest of the field on notice that she was back at the top of her game. After winning the opening set easily, Serena found herself battling in the second. While serving to extend that set into a tiebreaker, Serena literally went down when she began to experience pain in her calf muscle; speculation was that she was struck by a case of severe calf spasm. Once play resumed after a medical time out, a grimacing, teary-eyed Williams was unable to generate much power on her shots causing her to forfeit the second set. With her movement gravely hampered, Williams’ prayers for a reprieve were answered by a two-hour rain delay during which she received additional treatment for her problem. Guts, shear determination, and a befuddled Daniela, who was conspicuously uneasy with having to beat up on a wounded opponent, helped Serena pull out a 6-2 win in the third set. Therefore, for your die-hard attitude Serena Williams, we at HialeahTennis.com salute you. You would think that having James Bond 007 (a.k.a. Pierce Brosnan) in the stands would make one nervous. Such a dapper and debonair presence in most cases might be a distraction, apparently not in the case of Marion Bartoli, to her he was a source of inspiration. Seeded 18th , Bartoli of France probably believed that she had no more than an outside chance to win against Henin, the world’s number one. After losing the first set 6-1, Bartoli should probably have discarded the idea of an “outside chance”. Yet, Marion stated that when she saw Brosnan, her favorite actor, in the stands she realized that she could not continue with such an embarrassing display. Bartoli started to perform better, propelling her to win the second set. On the other hand, Henin surprised by the turn of events essentially became unglued. Henin’s level of play took a nosedive. Shots which for her were usually a surety were converted into errors leading to her dismissal in the third set 6-1; Henin’s quest of obtaining her first Wimbledon trophy will have to be postponed yet another year. Tied for second place are these two matches on hardcourt for the quality of the shots although only one went the distance. Roddick could not have performed any better; his serve was phenomenal while his groundstrokes were dead on. Yet, Federer decked out in his Darth Vader evening attire had the force with him. The first two sets were decided by tiebreakers with Federer coming up with some surreal passing shots while Roddick tried all within his powers to stave off the assault. After loosing the first two sets, Andy was a broken man and fell in the third set 6-2. This match was reminiscent of his play at Wimbledon 2004, where as Andy stated he “threw everything at Roger but the kitchen sink” and still could not get the victory. So maybe next time, Andy will need to remember to bring the kitchen sink. In what turned out to be a spectator’s dream for an opening round contest at a major, this five set thriller was jam packed with first class shot making from both Stepanek and Djokovic. This 4-hour and 44-minute marathon fittingly ended with a fifth set tiebreaker where Djokovic prevailed, the initial step towards his punching his ticket to his first grand slam finals. The hallowed grounds of tennis’ premiere tournament were the setting for this epic battle between these top-ranked contenders. For the first time since capturing the number one ranking several years ago, Federer was at risk of being displaced by Nadal. The match started out with Roger pulling ahead in a tough first set tiebreaker. In the second set, Roger had the chance to place further distance between himself and his opponent, but Rafael picked up his level of play and equalized the match. The third set was also a fiercely contested affair which saw Federer come out on top once more in a tiebreak. At that point, one thought that Federer would put the pedal to the metal and run away with the trophy, but much to Federer’s dislike, Nadal had more to say. Throughout the course of the match, Federer took exception with some of the calls that the electronic line monitor was making; repeatedly his challenges were proven wrong. A normally cool and composed player (let’s face it, the guy appears to hardly sweats on court), Federer almost went, ballistic, at one point asking the umpire to turn off what he felt was a faulty machine. Clearly, the tension was getting to Roger. A factor which probably contributed to his losing the fourth set 6-2. For the first time at his favorite grand slam, Roger would need to go to a fifth set to win. When Rafa took an injury time out, a rattled Federer was able to regroup and regain his composure; this permitted him to find his rhythm in the ultimate set where he broke Nadal twice to capture his fifth consecutive Wimbledon title.